So many people have asked what my favorite memory is from our trip to Africa, and surprise, I can’t choose. We experienced so many new things, saw culture and diversity we didn’t realize existed, animals in their natural untouched habitat that we thought we’d never see, and quite frankly, had the time of our lives. I’ve decided to post here about some of my favorite experiences. Hope you enjoy! One of my favorite memories, was an evening spent in the country of Swaziland. My brother-in-law has some friends that live there, working for US organizations. They were gracious enough to entertain us for the evening while we there, in the capital Mbabane (think “mmmm, ba bon”). 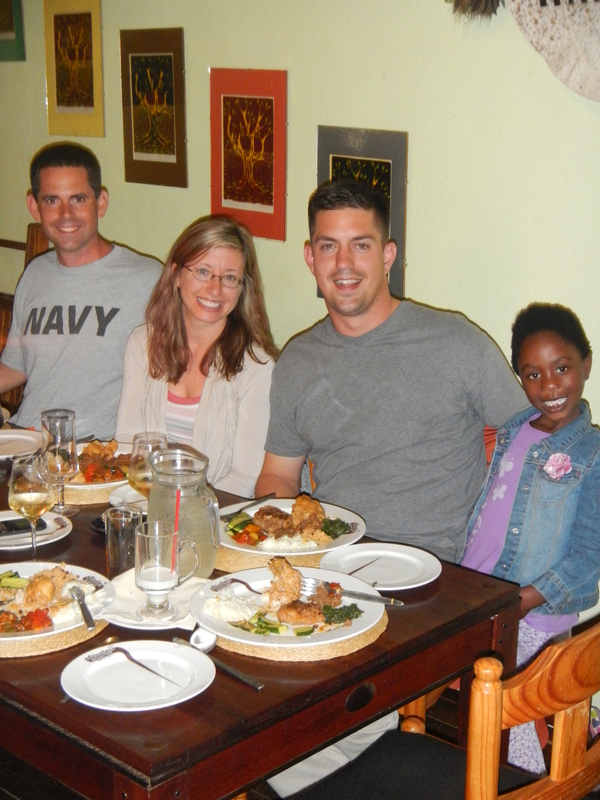 They’ve lived in Swaziland for 5 years, and have a daughter, Lily. We began the evening at their home for pre-dinner drinks (and may have found a black mamba snake-skin on the patio chair before sitting down, so we checked under the cushions 😉 ). Ironically enough-there was a show on PBS the night before we left for Africa, featuring the Black Mambas in Swaziland, so I was promptly instructed by my mom, to be careful. There is something so captivating and charming, about meeting and interacting with individuals who are living and working abroad, they’re special people. 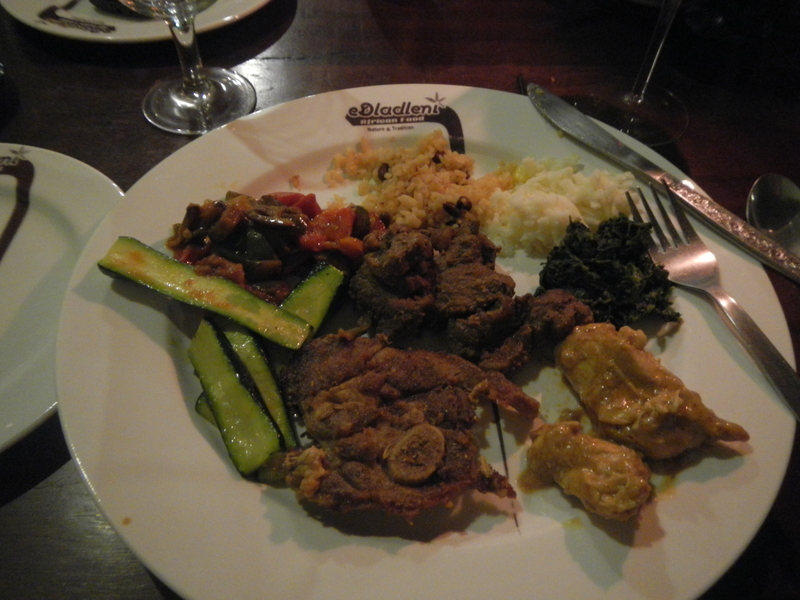 After we had drinks, we headed to a restaurant they’ve been frequenting for years: eDladleni. They had what appeared to be an awesome relationship with the chef, who goes to France for a week each year, and is really into the slow food movement. There was no ordering. She served us creations that she’s come up with, family style. It ended up being probably a 14 course meal-it just kept coming. It was amazing. (Of special note, there may have been an ornery goat, that kept sneaking in the restaurant to try to eat the cushions on the chairs, hee hee). We ended the evening, having more drinks back at their home. Not only was the company gracious, the food was amazing, and the conversations fascinating. Truly something I will cherish forever. This entry was posted in African Memories and tagged Africa, eDladleni, Impala, Pop-pop, Slow Food, Swaziland, Warthog by livinglikelinds. Bookmark the permalink. I love reading about your travel experiences!! SO MUCH FOOD. I want it. You look so happy 🙂 So glad you had such a fabulous time!!! Curious, did the impala and warthog taste like chicken. What an amazing experience. I’m so thankful you got to have the experience. The warthog reminded me more, of beef. A little more tough-but SUPER DUPER YUMMY. The impala reminded me more of chicken with a little more fat.